An influential Liberal party fundraiser testifying at the Bastarache Commission has denied allegations he ever tried to make Quebec's former justice minister name "Liberal-friendly" judges to the bench. 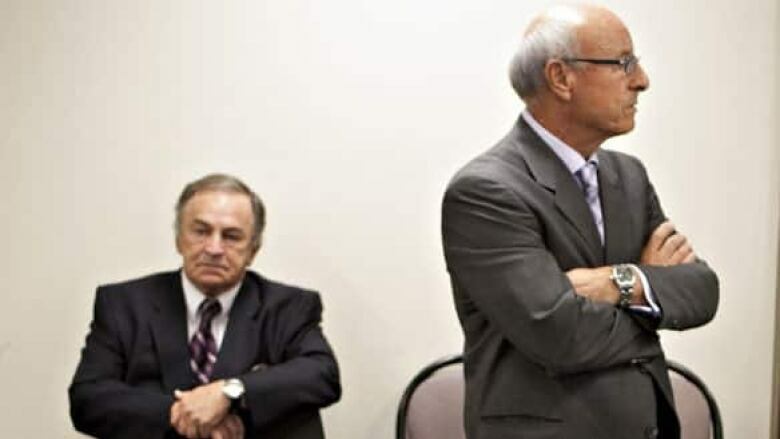 Quebec Liberal Party fundraisers Charles Rondeau, left, and Franco Fava wait on Wednesday in the back of the room at the Bastarache Commission into the appointment process for judges. ((Jacques Boissinot/Canadian Press))An influential Liberal party fundraiser has told the Bastarache Commission he never tried to make Quebec's former justice minister name "Liberal-friendly" judges to the bench. A lawyer by profession, Franco Fava is a well-known figure in Quebec's construction industry and political circles. He and his brothers ran Neilson Excavation, a construction company founded by their father. Former Quebec premier Robert Bourassa named Fava to Quebec's Health and Work Safety Board (CSST) as an employers' representative. Fava is a longtime Liberal supporter and fundraiser, netting the party tens of thousands of dollars in donations annually. Franco Fava appeared in front of the provincial commission on Wednesday to answer questions in the probe examining judicial nominations in the province. Former justice minister Marc Bellemare has alleged Fava used his clout as a major fundraiser for the Quebec Liberal Party to try to influence judicial appointments to favour Liberal-friendly candidates, with Premier Jean Charest's knowledge. "Absolutely not," said Fava, who told the commission he met Bellemare only once while the latter served as justice minister in Charest's cabinet. That meeting was prompted by Bellemare, Fava said, who called him about Bill 35, a law to reform administrative tribunals. Fava said he crossed paths with Bellemare on a casual basis once at a Quebec City restaurant and during some fundraising events. 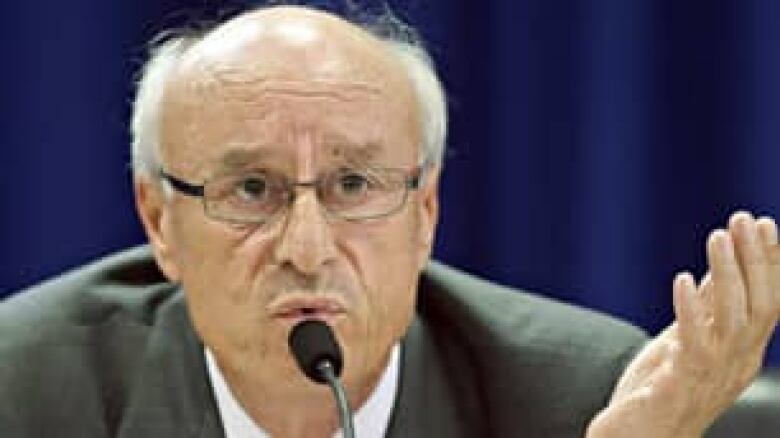 His assertion contradicts Bellemare's core allegations that Fava pressured him to name three people to the judiciary – Michel Simard, Marc Bisson and Line Gosselin-Després – while he ran the justice ministry in 2003 and 2004. Another Quebec Liberal fundraiser, Charles Rondeau, testified at the commission earlier this week that he visited Charest's office 20 times in 2003 – after the party took power – with a list of Grit loyalists for hire. In testimony last week, Bellemare told the commission he spoke to Fava on several occasions by telephone and ate at restaurants with him almost a dozen times — encounters in which the fundraiser exercised "colossal" pressure on him to heed his judicial nomination recommendations. Fava is one of the most successful Liberal fundraisers in Quebec. ((Jacques Boissinot/Canadian Press))Fava has been involved in party fundraising for decades and has cemented a reputation for consistently raising hundreds of thousands of dollars for the Quebec Liberal Party, through cocktail events and golf tournaments. The veteran fundraiser could not provide any material proof on Wednesday to back up his testimony. Bellemare, who testified at the commission last week, has come under fire for also failing to back up his allegations with a paper trail or other material records. Fava also denied allegations made by former bureaucrat Georges Lalande who earlier testified at the commission that the fundraiser spoke to him at least three times about judicial nominees. Other Liberals have admitted they put in a good word for friends and family for various jobs, including judgeships, after the party took power in 2003. Fava said Bellemare's public allegations against the party and Charest in the spring of 2010 sprang from a "vendetta" against the premier. Bellemare's lawyers will cross-examine Fava on Thursday morning, setting the stage for Charest, who is scheduled to appear at the commission in the afternoon. Retired Supreme Court justice Michel Bastarache is overseeing the judicial nomination commission, which is in its fifth week.